Our host, Ferris Wheelers Backyard & BBQ serves up a delicious meal! Make lunch plans here! ~ Bring a mat, water bottle, and towel. ~Class is outdoors. Dress appropriately for the weather. ~ We recommend wearing clothing that completely covers your back. The goats love to interact and jump on people and their hooves can scratch bare skin. 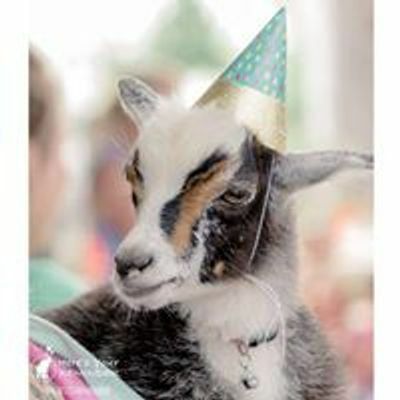 **Did You Know** Happy Goat Yoga-For Charity and It's For Charity! Events offer these and other popular fundraising classes throughout the DFW area. Check out www.HappyGoatYoga.eventbrite.comand www.itsforcharityevents.eventbrite.comfor all programs, dates and fun locations. "In the case of bad weather, class may be rescheduled. If any changes occur, ticket holders will be notified with details via e-mail (that is registered with ticket). In lieu of refunds, tickets may be transferred to another available, scheduled date. We will also post updates on our Facebook page. Make sure you're following us!" 1. Is there an age requirement? A. Unless specifically stated, our FUNdraiser events are family friendly. We welcome all well behaved children to join in on the happy-vibes. We just want to ensure all of our guests have a fun time. 2. Does my young child need a ticket? A. If he/she is going to participate, yes. If he/she is going to share your mat, no. 3. I’m not into the yoga, but can I still come to play with the animals? A. Yes! For many of participants, this is their first yoga experience. Many will sit and enjoy “cuddle” therapy throughout the class. No one is mad at that! You can also come for “Playtime Only” during the second hour. We only ask that you make a donation for the charity the event is benefiting when you arrive. 4. Do you have extra yoga mats? A. We do have a few extra yoga mats at our events. They’re first come, first serve. We do recommend bringing your own if you have one. P.S. Have extras? Please donate them to us! 5. I am no longer able to make it to the event, can I get a refund? A. If its prior to the 7 day refund policy, yes. You will request a refund via Eventbrite, on the same page you bought your tickets. You also have the option to transfer your ticket to another date/event. Simply email us your request. If you are after the 7 day refund policy, no, we do not issue refunds. Instead, we will happily transfer your ticket(s) to another event we offer. 6. What happens if it rains? A. We only call a class if/when rain looks definite. If we do get rained out, the event will be rescheduled. When any changes are made, all ticket holders will be emailed via Eventbrite to the email address associated to your tickets. We’ll also make a post on the Facebook Event Page. Make sure you’re following the page! 7. My event was rescheduled due to bad weather. The new date is inconvenient for me, can I have a refund? A. We do not issue refunds due to rain outs. However, we will happily transfer your ticket(s) to another event we offer that is more convenient. If you don’t see a date that works for your schedule that is currently listed, we add new events every week. Once you see a convenient date, simply email us the new details and your tickets will be honored. 9. Do you give group discounts? A. Yes, we offer discounts for groups of 10 or more. Simply message us. Did you know, any of our happy-vibe events are the perfect way to celebrate any special occasion? !